My kid and nephew are recently inclined with trading game cards and while I may, they are safe, I never really understood how they are played. My kid asked me to buy him a DUEL MASTER trading card set and while they look appealing in characters, I don't know actually the game loops. So, I dig in how a trading game particular Duel Masters is played, here is an excerpt from boardgamegeek.com. 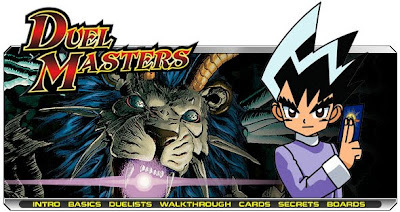 In Duel Masters, players build a deck of creatures and spells using cards from starter decks and booster packs. Your creatures are brought into play by paying the mana cost associated with it and are used to attack your opponents creatures or shields. Each player starts the game with 5 shields in play. These shields are merely 5 cards from your deck that are dealt face-down in front of you before the game starts. The shields, along with any "tapped" creatures you have in play, form your defenses. When a creature attacks a player and isn't blocked, that creature breaks one of that player's shields. Each time a player's shield is broken, the player puts the shield into his hand. You win the game if on of your creatures attacks your opponent when he has no shields left (as long as your creature isn't blocked). Duel Masters is played in a very similar fashion to Magic: The Gathering, which is also made by Wizards of the Coast. Much of the terminology used in Duel Masters is the same as in Magic as well, such as "tapped", "summoning sickness", etc.